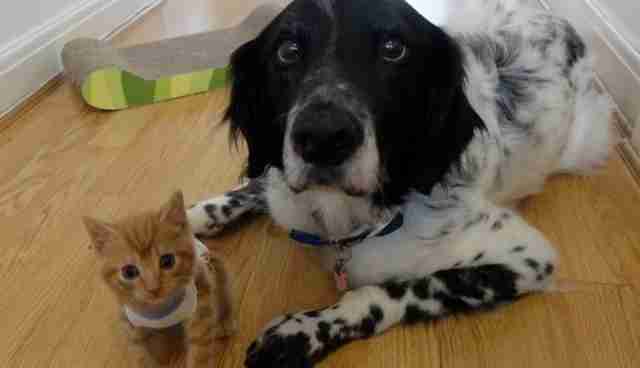 George and Elton are two tiny kittens who were found abandoned in an Osterley, London shed on August 1. 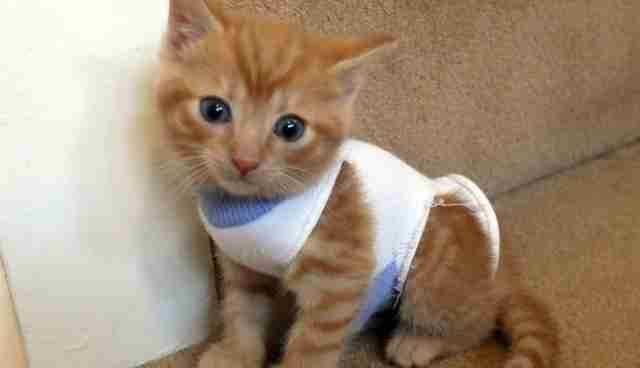 When the kittens were discovered, they were barely alive, according to London Evening Standard. Luckily, the baby felines were rushed to the RSPCA's Putney Animal Hospital, where veterinary nurse Katrina Devita took the pair into her home to hand-raise them. The two little kittens had a habit of suckling one another in their sleep, which was leaving them sore. This sort of behavior is not uncommon in kittens who have been orphaned or weaned too early, and some continue to attempt suckling well into adulthood. 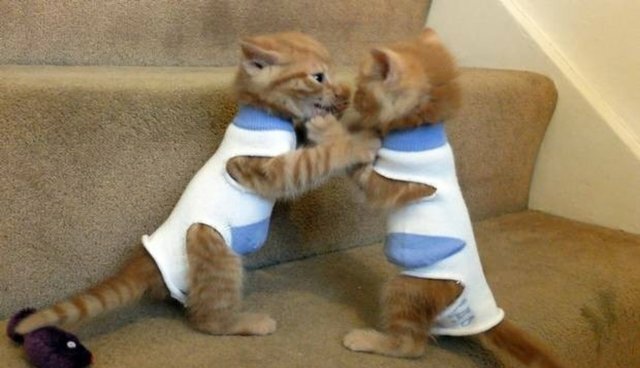 In order to keep the kittens from making each other sore, vet nurses made them tiny, protective vests using baby socks. This way the kittens won't be encumbered by anything heavy, and won't continue to irritate one another's delicate skin. We are seeing such a high number of kittens coming into our care, and we would like to urge people to remember to get their cats neutered to try and avoid unwanted litters of kittens. Hand-rearing is so time intensive and our staff are overwhelmed by the sheer number of cats and kittens that need our help. This year, the RSPCA has apparently taken in 14% more abandoned cats than in previous years. Always consider adoption if you feel ready to provide a forever home for a new pet. As for George and Elton, these two handsome fellas will become available for adoption in about a month – and will be adopted together.